18. IV. THE REVOLUTION NEEDS YOU ! (use of this word [?]) 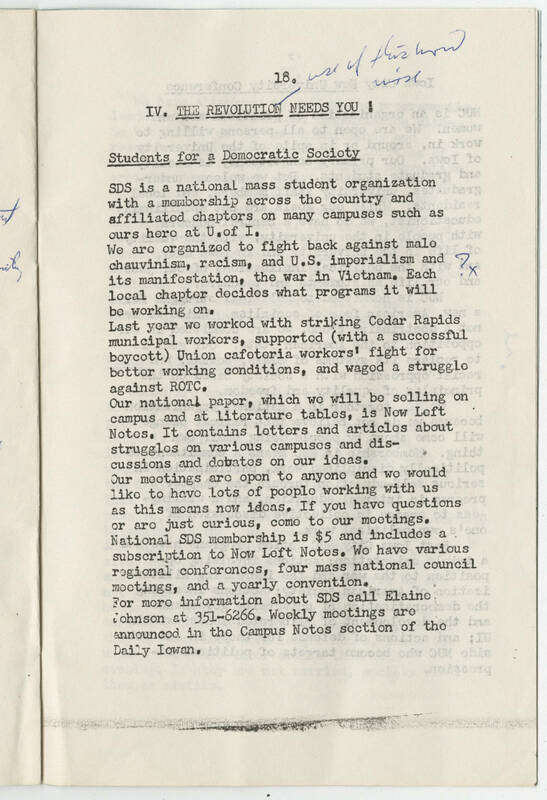 Students for a Democratic Society SDS is a national mass student organization with a membership across the country and affiliated chapters on many campuses such as outs here at U of I. We are organized to fight back against male chauvinism, racism, and U.S. imperialism and its manifestation, the war in Vietnam. Each local chapter decides what programs it will be working on. Lat year we worked with striking Cedar Rapids municipal workers, supported (with a successful boycott) Union cafeteria workers' fight for better working conditions, and waged a struggle against ROTC. Our national paper, which we will be selling on campus and at Literature tables, is New Left Notes. It contains letters and articles about struggles on various campuses and discussions and debates on our ideas. Our meetings are open to anyone and we would like to have lots of people working with us as this means new ideas. If you have questions or are just curious, come to our meetings. National SDS membership is $5 and includes a subscription to New Left notes. We have various regional conferences, four mass national council meetings, and a yearly convention. For more information about SDS call Elaine Johnson at 351-6266. Weekly meetings are announced in the Campus Notes section of the Daily Iowan.